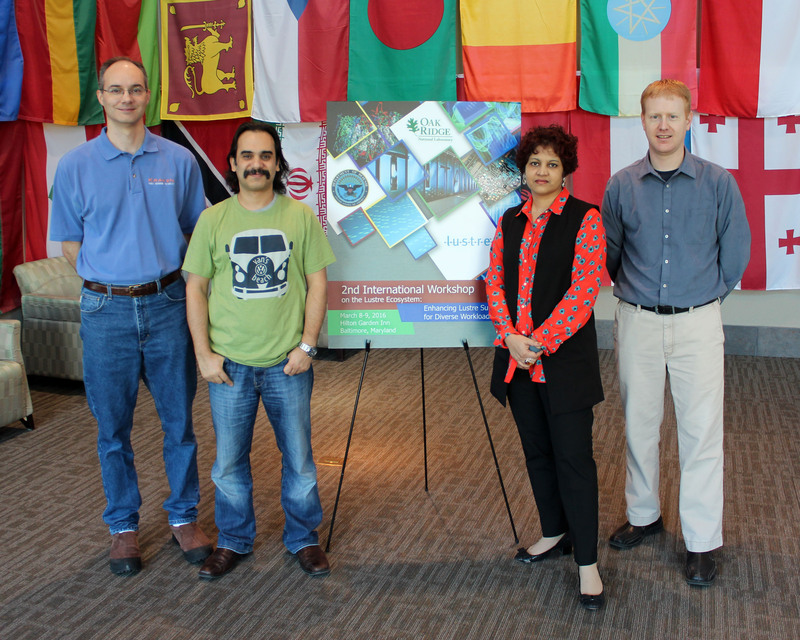 From left, Rick Mohr, JICS/NICS system administrator; Sarp Oral, file and storage systems lead, Technology Integration group, Oak Ridge National Laboratory (ORNL); Neena Imam, program director, Extreme Scale Systems Center, ORNL; and Michael Brim, research associate, Computer Science Research group, Computer Science and Mathematics Division, ORNL. This collaborative team provided leadership at the Second International Workshop on the Lustre Ecosystem, March 8–9, in Hanover, Maryland. Rick Mohr, a high-performance computing system administrator at JICS and NICS, served as tutorials chair and as a member of the Technical Program Committee for the Second International Workshop on the Lustre Ecosystem: Enhancing Lustre Support for Diverse Workloads held March 8–9 in Hanover, Maryland. “The Lustre parallel file system has been widely adopted by scientific high-performance computing centers as an effective system for managing large-scale storage resources,” according to the conference's Web site. The goal of the workshop is to help explore improvements in performance and flexibility for Lustre beyond the traditional scientific applications workload. This year’s workshop was the second in a series that began last year. Program co-chairs were Neena Imam, Michael Brim, and Sarp Oral of Oak Ridge National Laboratory (ORNL). The conference featured tutorials from government agencies: Lawrence Livermore National Laboratory and ORNL; academia: the University of Tennessee, NICS, and Indiana University; and Industry: BP. “The Progressive File Layout feature for Lustre is one that is currently under active development, and this feature will offer significant new flexibility in optimizing Lustre file layouts for various I/O [input/output] patterns,” Mohr said. Slides for all tutorials and technical presentations are accessible through the conference Web site Agenda page. *In reference to Mohr's technical presentation: This work was supported by the United States Department of Defense (DoD) and used resources of the Computational Research and Development Programs at ORNL.